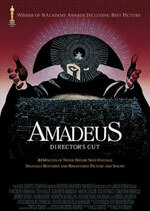 Antonio Salieri (F. Murray Abraham) claims he’s killed legendary composer, Wolfang Amadeus Mozart (Tom Hulce). He is now of old age and recounts the stories of his youth and his interactions with Mozart to a priest. The story flashbacks to when the two first met. Mozart, already a star, was hired to write a complete opera in German. He is not exactly the most pleasant human being and Salieri finds Mozart rather immature and arrogant. Still, no one, not even Salieri, can deny his brilliance. Plagued with a deep and heavy jealousy, Salieri begins to chip away at Mozart in whatever way possible—using Mozart’s strained relationship with his father to his advantage by making Mozart feel extreme guilt over the state of his and his father’s relationship. This event was the trigger to Mozart’s slight-insanity and the event that led to Mozart’s debilitating health. Salieri, in his old age, must deal with the ramifications and guilt of having killed one of history’s greatest artists. 11.2.2016 12jirka inserted real photo of the filming location The gate of the Movie Amadeus. 21.4.2014 Jessica2014 inserted storyline of the Movie Amadeus. 12.5.2013 Teoretik inserted real photo of the filming location Little Mozart of the Movie Amadeus. 19.2.2012 yurasch found address of the filming location A night on the street of the Movie Amadeus. 19.2.2012 yurasch inserted real photo of the filming location A night on the street of the Movie Amadeus. 21.1.2012 Teoretik inserted real photo of the filming location In the hospital of the Movie Amadeus.